I drive to California Airways at Hayward (KHWD), not really sure what’s going to happen, but curious and not particularly worried about much. I haven't flown with CalAir for years, and this is my first flight PIC from anywhere since August last year, and I'm wondering whether I should be getting back into flying — almost all the things that were true when I announced I was going to take a break are still true, and it's going to be a long and difficult-to-schedule return to regular GA flying, if I make it at all. And while I renewed my medical and KOAK ramp badge, I'm way out of currency with almost everything, and need to do a BFR. It starts well when I walk up to the CalAir office and there’s Keith, playing a fighter pilot shoot-em-up on a large screen overlooking the runway. He looks up at me, grins, and says “Well, well, well — look who the cat dragged in!” We talk a bit about the TSA, Hayward Airport's (non-) security, and how GA’s dying — pretty much the same things we talked about the last time I saw him, all those years ago. It's good to see him again. The office is buzzing with students and instructors, which is always a good sign. John and I sit down and discuss the flight — what's the aim, what's the agenda? 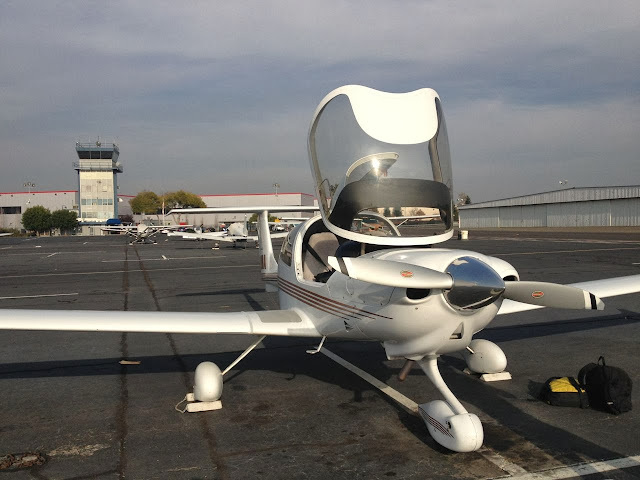 I still haven't even started my BFR, so that's a possibility, but really, for me, it's mostly just about getting back into flying after a 16 month absence, and becoming familiar with a new plane, the Diamond DA-40, a type of plane I've never even seen before as far as I know. If I can still take off, land, and do basic airwork without major issues in a plane I've never seen before, I'll be pleased; I'm really not that fussed yet about the BFR. Aim low, I tell John. He seems amused by this dedication to underachievement, and we decide we'll just head for the Diablo practice area and do a bit of airwork and see what happens. It's a hazy day in the Bay Area, and it's even hazier out in the Valley, with Livermore (KLVK) reporting three miles visibility, which makes me a little cautious. John spends some time prepping me for the DA-40 — some idiosyncrasies in the controls, the G1000 (which I remember well), the V speeds, the best way to approach and land, etc. — and then there's a bit of paperwork (bringing my club records up to date mostly), and then we’re ready for the plane. At the old CalAir location, you simply walked out of the building onto the ramp, but the new location’s at the eastern end of the airport on Hesperian, and we have to drive to the Green Ramp near the tower up towards the other (western) end of the airport. As an Oaklander normally based at KOAK, with its high security and all, I sort of expect to drive up Hesperian, park in the parking lot under the Tower, then walk on to the ramp, but this is Hayward — we just drive through the gate onto the ramp (there's a combination lock there), then drive up the marked vehicle access “road” on the tarmac on the north side of the airport to the Green Ramp, and park right near the plane. Cool! The Green Ramp looks almost deserted, which is not a good sign, especially since when I last flew out of Hayward, it looked difficult to get a space there. The plane’s pretty much what I expected — sleek, relatively modern-looking (at least compared to a 172), and in good condition. We spend maybe twenty minutes doing a thorough pre-flight, using John's iPhone checklist app and his DA-40 specific checklist (we tried getting it to work on my iPad checklist app, but it didn't take, for some reason), and there’s nothing much to report about this except it all made sense and there’s really nothing unfamiliar or surprising about the mechanical bits. One of the news helicopters lined up next to taxiway Alpha a hundred metres away starts up and flies off, and three or four shiny business jets taxi past interspersed with a handful of smaller 172s. The noise is at times too loud for talking, but I'm not complaining — it's a welcome, very familiar background chorus. We get in, which is a little difficult the first time — the canopy is large, and it should be easy, but it isn't, for some reason, possibly due to the need to drop in rather than climb in. I don't know. Once in, I have to adjust the rudder pedals rather than the seat — the seat's fixed, and at first this feels weird — there are simply no adjustments at all for the seat, meaning it's basically a like it or lump it thing. I'm not sure I like it at first, but we'll see. The first problem is immediately obvious: my old iPad 3 won't easily fit on my thigh (like it did with the 172) because the DA-40 uses a stick; the iPad just gets in the way, much more than I'd expected. This is actually something of a long-term show-stopper — I have to rely on John's iPad mini as held and manipulated by him — but with the G1000, at least, for VFR it's no big deal, just annoying. The good news? My old Lightspeed headset still works. Battered, clunky, bulky, and outdated, but still usable. I follow the checklist for startup, and it starts first time, which always seems to be a bit of an accomplishment with fuel-injected GA engines like this; I feel gratified. The engine controls (prop, throttle, mixture, etc.) feel familiar — I have a complex endorsement, some time in complex aircraft, and the G1000 really makes this sort of thing easy to monitor and control. We go through the checklist again, then I call Ground. The second issue… argh! The call sign is weirdly difficult to say (some just are, for pilots and controllers alike; the AAC's old (and long-gone) N5445H was the worst I've had to use), and it'll take a long while to get used to saying — and hearing — “Diamond Star …” rather then “Cessna …”. Oh well. We request a right crosswind departure from 28L and get taxi clearance. I do the runup in the runup area — nothing weird or unusual about this, either — then we saunter up to 28L at Alpha. I call tower, and get told initially to hold short for traffic in the pattern (a 172 I can see on downwind for 28L), then get a quick “2 mike alpha, cleared for immediate take off runway 28L, traffic's on left downwind, right crosswind departure approved” (or something like that). I get the hint, and we do a fast arcing turn onto the centreline, and start the takeoff run. The DA-40 has a castoring nose wheel, with little rudder authority below about 30 knots, so you have to use differential braking on the ground for most turns; this can be an issue for the first few hundred metres of the takeoff roll, as you really don't want to use braking to maintain directional stability as you're trying to accelerate, but what else is there? I'm familiar with this from both the Tiger and the Cirrus, but it's still a bit annoying, especially on narrower runways. Still, we survive, and I rotate at Vr — or, rather, the plane lifts off with little input from me on this, before I'd even started to pull back on the stick. Flaps up and fuel pump off on initial climb out, then a quick right turn to heading 030, then we're on our way. Pull the prop back to 2400, keep the throttle full forward (this plane is fine running continuously oversquare), and we climb quickly — we have a 1400' ceiling here below Oakland's Class C airspace we can't break for several minutes, and I have to be very careful with this (I'm used to departing Oakland, where this isn't an issue as long as you stay out of the much higher KSFO Class B airspace, which is easy). The controls all feel absolutely fine to me — it's a nicely balanced plane, and nothing about stick or pedals feels weird or uncomfortable. But the climb out angle at Vy feels too high for me, and I drop the nose a bit so I can see better. Once past the edge of the Class C we climb towards 3,500 and head out over the hills. For the first time I can see the Diablo Valley, and it's really hazy. I tell John I'm not sure I'm comfortable with doing airwork out there — the visibility is MVFR at best, and I'd like to be able to actually see other planes while doing steep turns, etc. John's OK with that, and suggests we circumnavigate Mt Diablo, which I'm up for. I quickly get a feel for the trim on this plane — a lot more sensitive than the 172, but easily usable, and within a few minutes I'm very comfortable with the way it all handles. As John says, there's a nice harmony between aileron and elevator controls, and the engine's efficient and effective. After leveling off and proper trimming and leaning, we're doing (from memory) 135 KIAS on 75% power at 9.5 GPH, which is considerably better than a 172. I engage the autopilot (a bog-standard KAP 140, something I could probably use with my eyes closed), and we start around Mt Diablo. The view from up here is hazy, wintry, beautiful, almost monochromatic. On the far side, John asks if I'd like to go over to Rio Vista (O88) for landing practice. Of course! We set the GPS accordingly, and off we go. Ground visibility here is poor — a few miles — and the sight of the windfarm's windmills in the same nearly monochromatic soft Delta haze is other-worldly. We can hear another plane in the pattern on CTAF, using runway 33; we want to use 25, and John carefully negotiates our way into this with the other pilot, who sounds a little grumpy at the intrusion (he leaves the pattern after our first landing, leaving us to ourselves for the rest of the exercise). Runway 25 is longer and wider than 33, and for my first few landings, makes a lot more sense — and, in any case, there really isn't a lot of wind in any direction on the ground (or at altitude) today (hence the haze). John does the first landing on 25, talking me through it, then hands the controls to me again on the upwind. The pattern is straightforward, and I do OK — flaps, prop, mixture, fuel pump, throttle, etc., and on final it all looks good. I realise once again — for probably the hundredth time in my flying life — that Rio Vista's 25 looks kinda narrow to this Big City Airport kinda guy. Luckily there's no significant crosswind, I guess. The first landing goes fine — this is not a plane you want to land in a full stall, unlike the 172, but that's no problem, and the sighting in my mind just works. This feels like it isn't going to be problematic, and it isn't — the rest of my landings here and back at Hayward are OK, perhaps a little agricultural sometimes, but the plane handles nicely, and while it's slippery and there's a lot of ground effect (the wings are quite a lot longer and thinner than a 172's), that's not a big problem if you think your way through it and hold off all the small adjustments you'd probably make in a 172. Again, the mental visualisation for landing this plane seems particularly easy, and while the differential steering thing could be annoying on rollout, it's not much of an issue for touch and goes. We do a handful of landings and pattern work, then depart straight out for Hayward. John calls Travis Approach for flight following back (I was about to do it myself, especially given the haze — I'm not one of those nutters who eschews ATC contact just because ATC is The Government or because they cherish “freedom”). The flight back to Hayward is uneventful, and, as suspected, it's a bit difficult to get back into Hayward itself without GPS — the haze and the glare is pretty bad. The conditions are a lot like my PP-ASEL checkride with Larry Peters, where I decided to use the ILS to get back to Oakland from several miles out (Mr. Peters was impressed and pleased by this, but what the hell else could I do safely?). We land back on 28R, and taxi to the Green Ramp. I feel pleased to have done it all without killing or scaring anyone, and with minimal clobbering around the head from John. The plane feels good, the flying was fun, and it was weirdly easy to land and handle the plane after all this time off — and in an unfamiliar cockpit. John seems fairly pleased as well. While prepping for the flight last night, I go through my old flight bag, trying to sort out the useless crap from the more useful crap (and occasional non crap). It's an odd experience. It contains the collected detritus and paraphernalia of nearly fifteen years of flying, spanning simple pilotage-based VFR through steam-gauge era IFR to complex GPS and autopilot IFR (with side jaunts for things like aerobatics). The biggest change is that I've simply junked my old paper backups — I was already using my iPad for charts and approach plates before the break, but I kept the old paper stuff around just in case. That doesn't make much sense any more, and in any case I stopped my paper subs a year ago, sort of forcing the issue. My ForeFlight app has been at the centre of my flying since it first appeared (I was a very early adopter, actually quoted on their website in the early days), but its role has changed from just weather and info to charts, plates, briefings, filings, etc. ; now it's difficult to imagine being without it, IFR or VFR. The result of all this is that my gear now fits in my normal backpack; I'm no longer carrying around a heavy black flight bag. I stand there thinking: will this all work? I don't know — I feel rusty at everything, especially packing for a VFR local flight. And I probably need a new headset if I'm going to take this seriously again. Not cheap.